Last year, about a week after his 6th birthday party, Ethan told me he wanted an "under the sea" party this year. He is fascinated with oceans and sea life. So, when spring rolled around this year, I tentatively started planning that party. 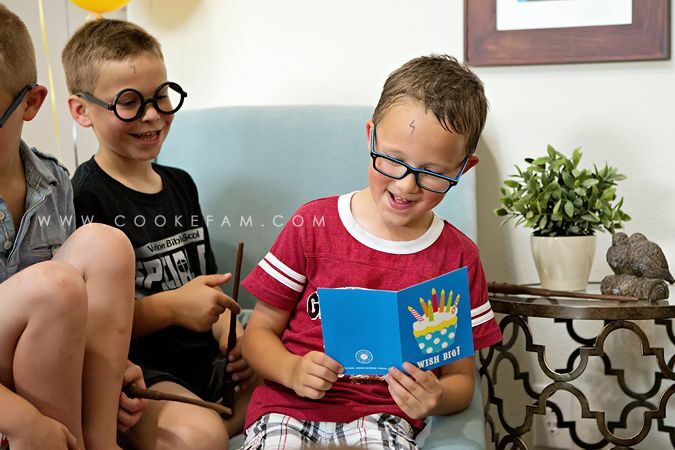 Then, Harry Potter hit our family when I started reading the first book to the boys. 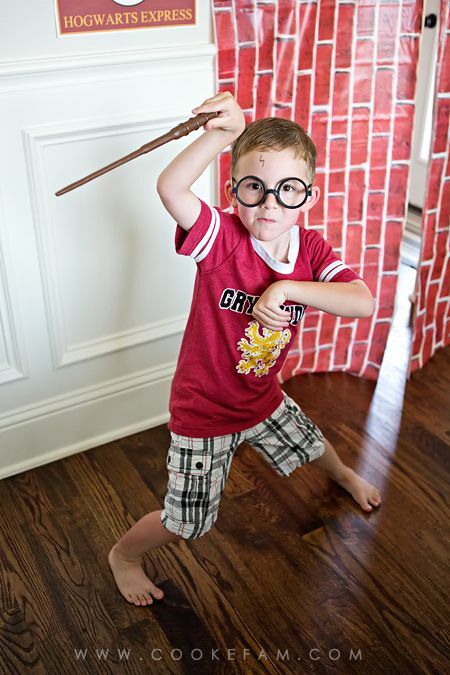 And then Ethan asked me if he could change his mind and have a Harry Potter party. There was never any question as to how I would answer him. Even if I was not such a huge fan myself, I would have gladly done that for him. And I hadn't gotten past the invitations for the other theme anyway. First, the invitations. I knew I wanted it to look like a Hogwarts letter. This design was actually printed on the front and back of a folded card so that it looked like the outside of the letter when it was closed and the inside opened up to the letter. I knew I had nailed it when Ethan was awe-struck when I showed these to him the day they arrived from the printer. 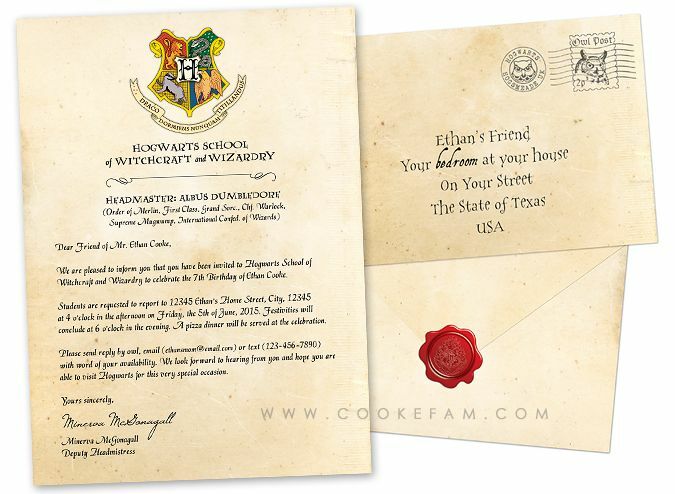 I don't care how much easier it is to do an Evite, there is just no replacement for receiving a Hogwarts letter invitation. 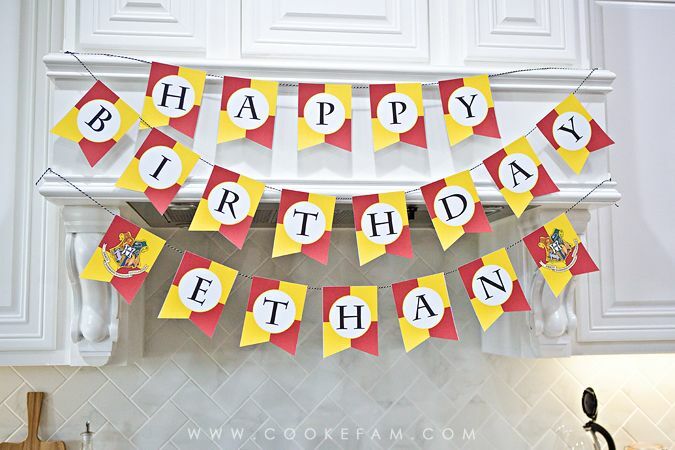 The text of the letter says: "Dear friend of Mr. Ethan Cooke, We are pleased to inform you that you have been invited to Hogwarts School of Witchcraft and Wizardry to celebrate the 7th birthday of Ethan Cooke. Students are requested to report to (our address) at 4 o'clock in the afternoon on Friday, the 5th of June, 2015. Festivities will conclude at 6 o'clock in the evening. A pizza dinner will be served at the celebration. Please send reply by owl, email, or text with word of your availability. 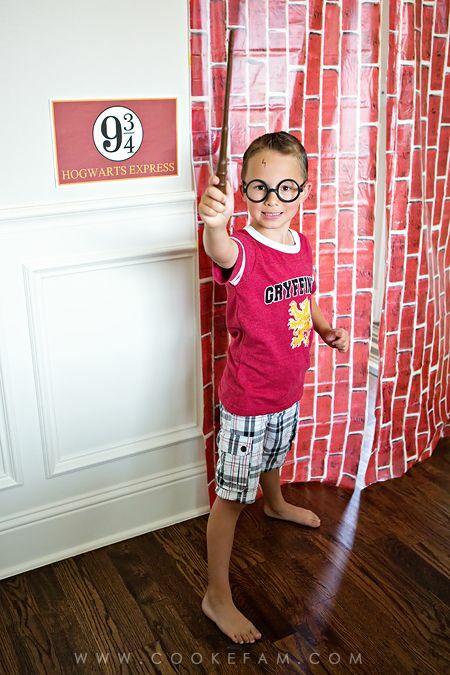 We look forward to hearing from you and hope you are able to visit Hogwarts for this very special occasion. Yours Sincerely, Minerva McGonagall, Deputy Headmistress." 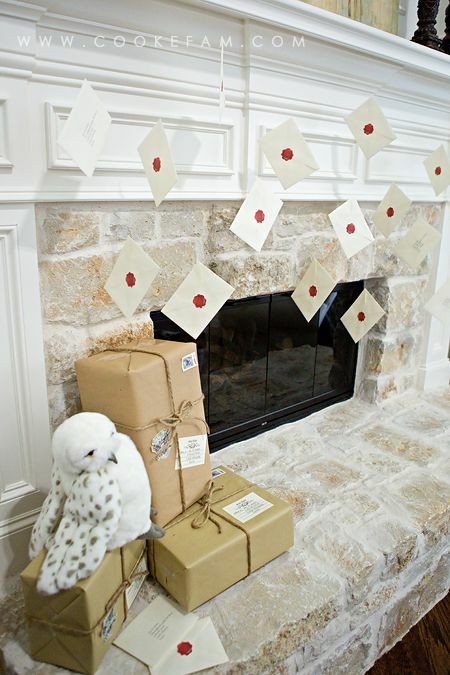 So then, with the invitations out of the way, I could get to the decorations. 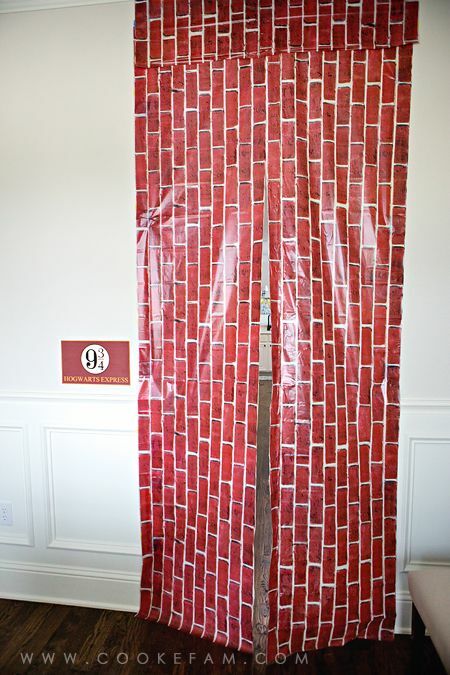 I don't know that I've ever had more fun with decorating for a party. I scoured Pinterest for ideas and came up with some gems. I could have done so much more, but selected the things I thought had the most impact, but were not so time consuming. 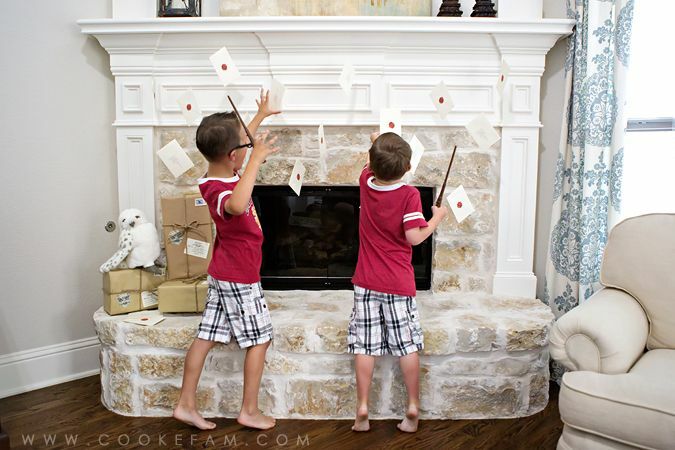 These letters hanging from our mantel were supposed to be like Harry's Hogwarts letters coming out of the Dursley's fire place in the first book/movie. 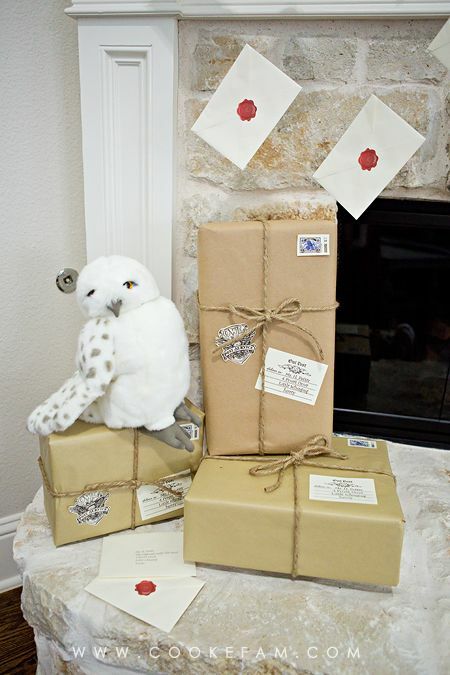 We also used the Hedwig plush we had bought at the Magical Menagerie in Diagon Alley a couple of weeks before. 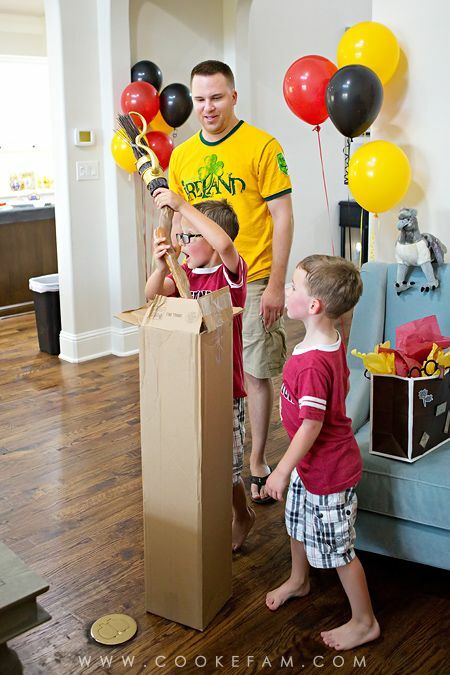 The packages are just Amazon boxes covered with brown paper. I added a few stamps and an address label as well. Parties at home are my thing. I love them. And mostly because these two love them. They always request parties at home and I could not be more happy to oblige. Seeing their faces when I put up the decorations makes it that much more fun for me too. 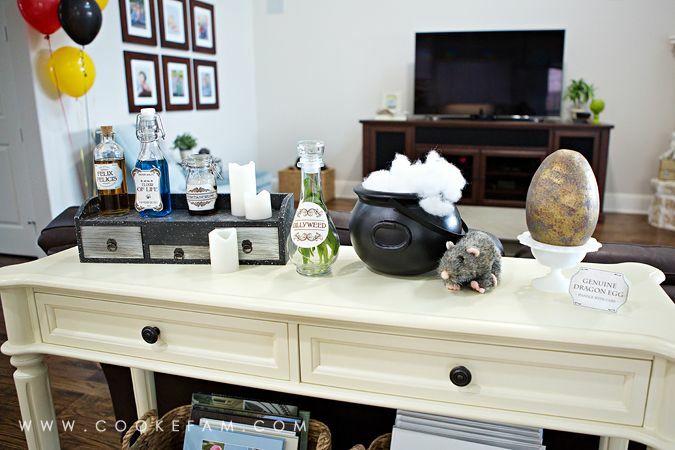 The potions table was a lot of fun. I collected those glass bottles...mostly from HomeGoods. 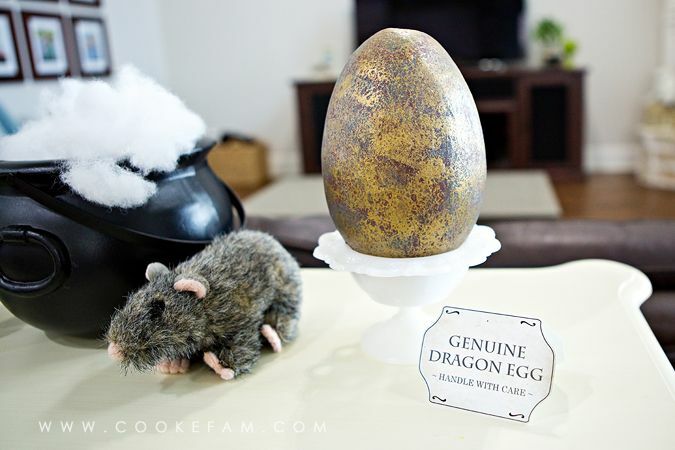 The dragon egg was a last minute addition and a special request from the birthday boy. 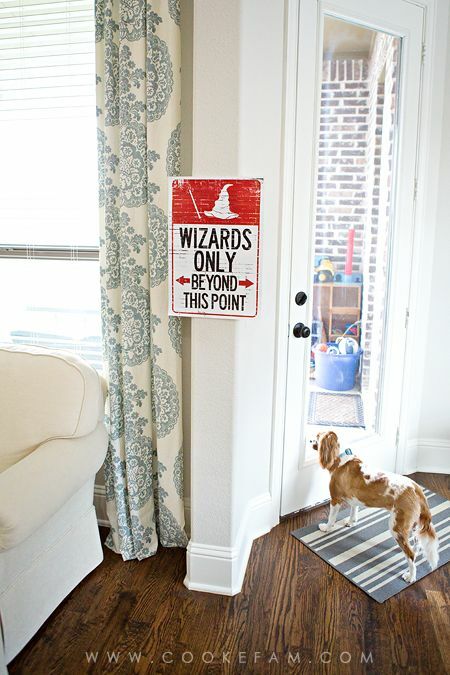 He wanted one like Hagrid's. It's just a paper mache egg that I sponge painted with 3 different colors, gold being the last one so it shimmered a little. I was actually pleased with the results, especially since it only took me about 5 total minutes to paint. Of course, Scabbers was hanging around too. 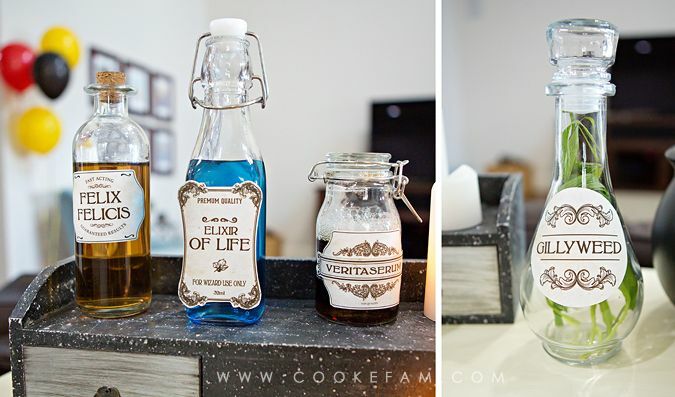 The Felix Felicis potion is cream soda, the Elixir of Life is water with blue food coloring, and the Veritaserum is root beer. The Gillyweed is actually tall grass that we quickly picked from the lot across the street from our house. The sweets table was the only one I really decorated. The pizza, grapes, and other savory foods were just placed on our kitchen table to make it accessible to the kids. 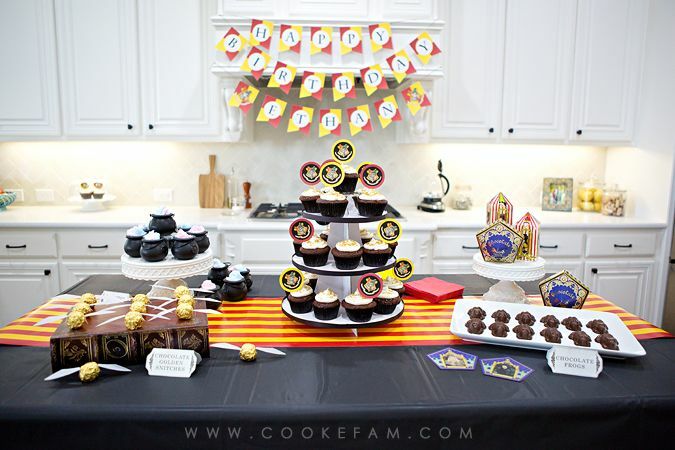 But here, I had some fun making some of the treats from the Harry Potter world. Ethan wanted chocolate cupcakes, which was easy enough. 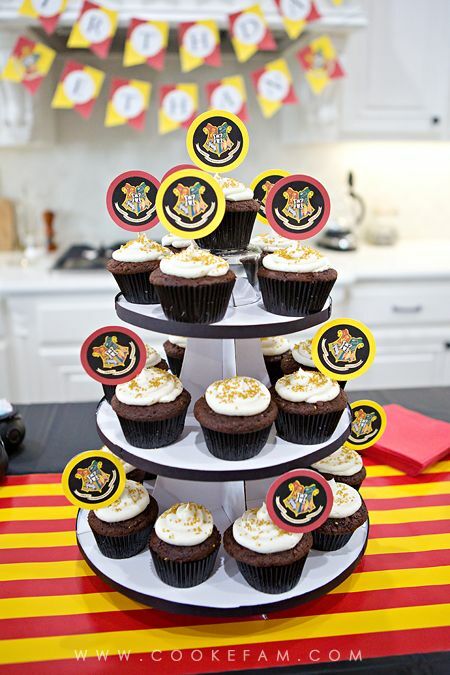 I added little gold sprinkles for a magical touch as well as the Hogwarts crests. 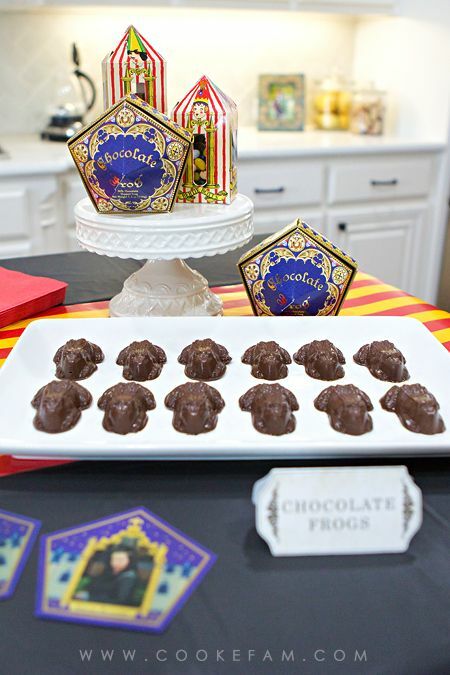 I found a frog candy mold to make some chocolate frogs...of course. Ethan was so thrilled by these. 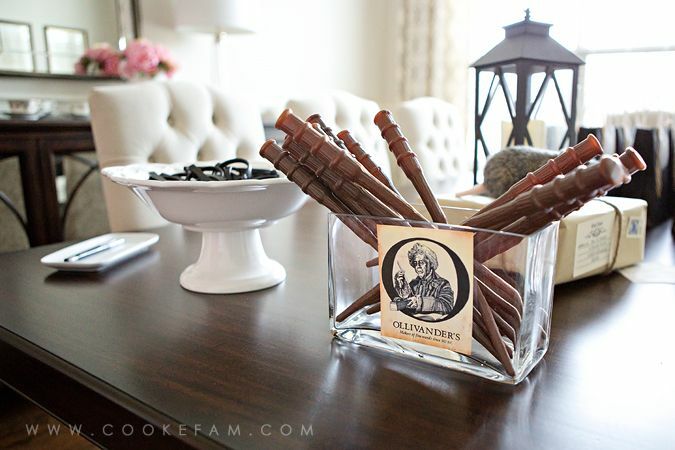 In the background, you can see some (empty) candy boxes we picked up at Honeydukes in Hogsmeade on our trip. 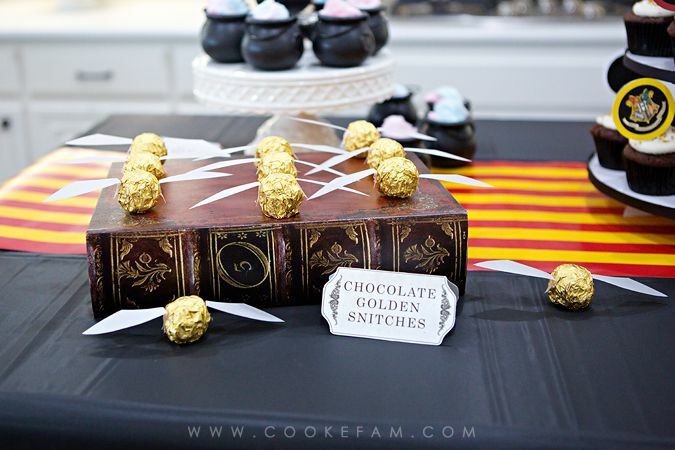 The chocolate golden snitches are Ferrero Rocher candy balls with vellum wings that I glued on. 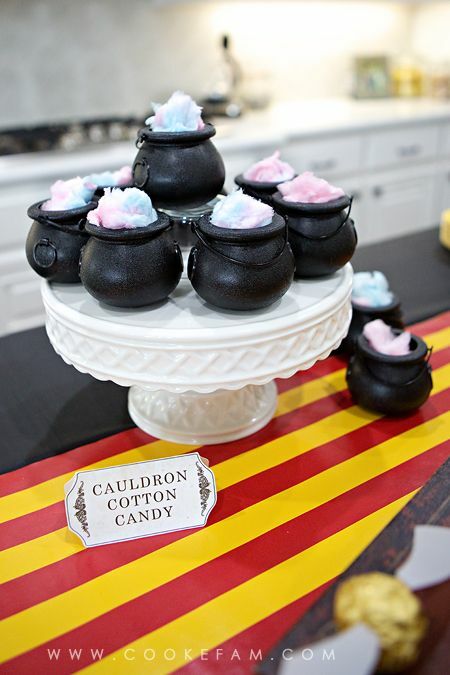 These mini cauldrons are filled with cotton candy, which also has the convenient effect of looking like smoke bubbling from the pots. Again, another hit with my boys. They loved this. 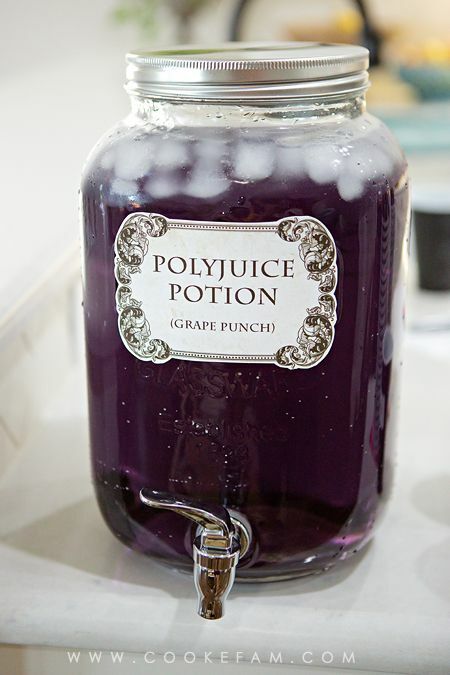 I went ahead and put the real identity of the Polyjuice Potion on the label so people would know what they were really getting. Although the kids didn't really care. 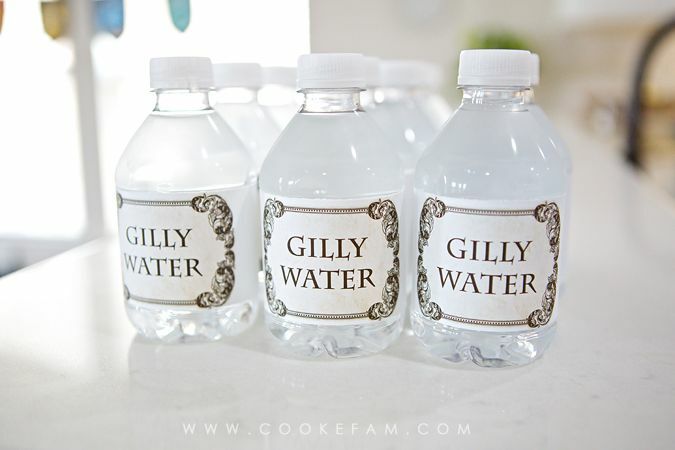 I wouldn't have even though to do Gilly Water labels on the water bottles until I saw the Gilly Water at the Wizarding World in Orlando. 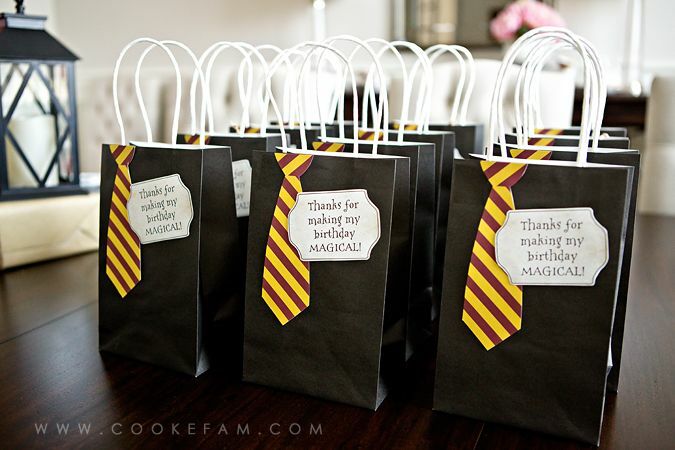 I went easy on the party favors this time and my favorite part of them were the little bags. 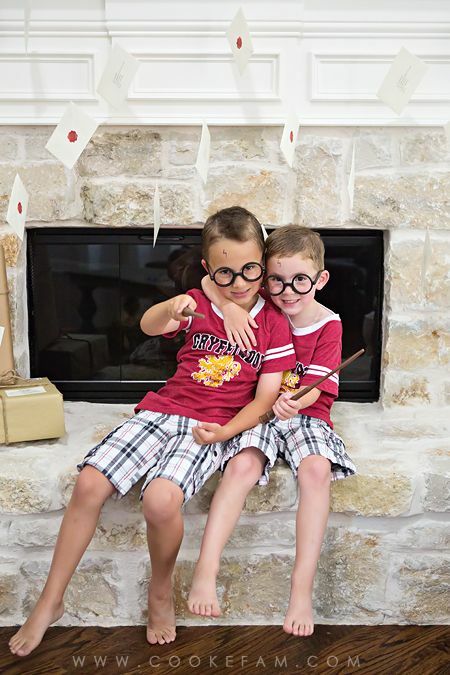 A Gryffindor tie and special message for Ethan's friend and that was it! 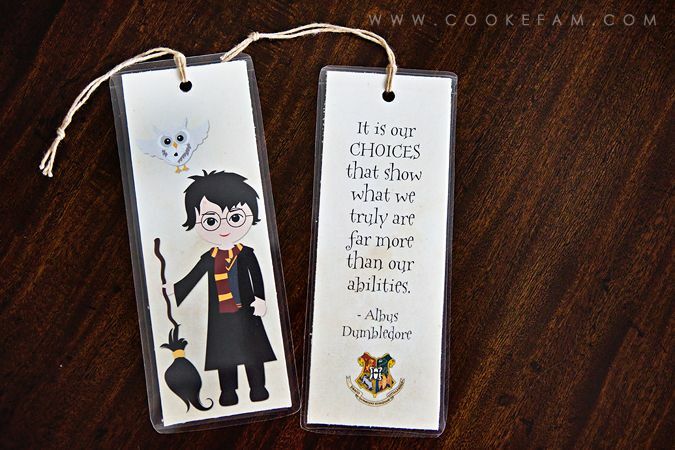 I made a bookmark in Photoshop using one of my favorite quotes. Then, I used self laminating sheets to seal them and added a string. Also in the bags was a small box of Bertie Botts Every Flavor Beans that I purchased on Amazon. 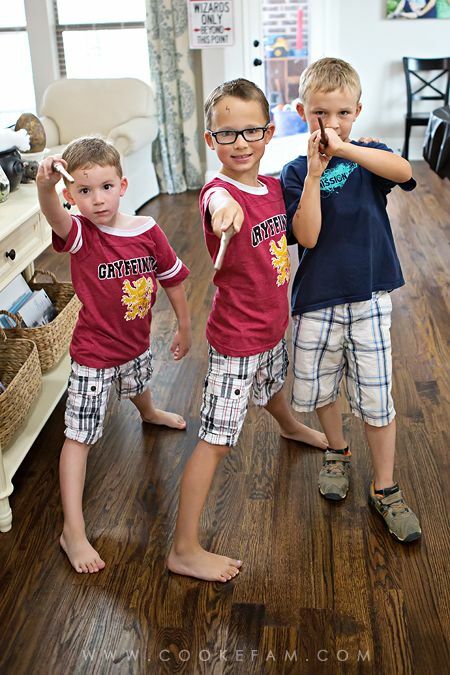 The kids added their wizard paraphernalia (wand and glasses - see below) to their bags when they left. 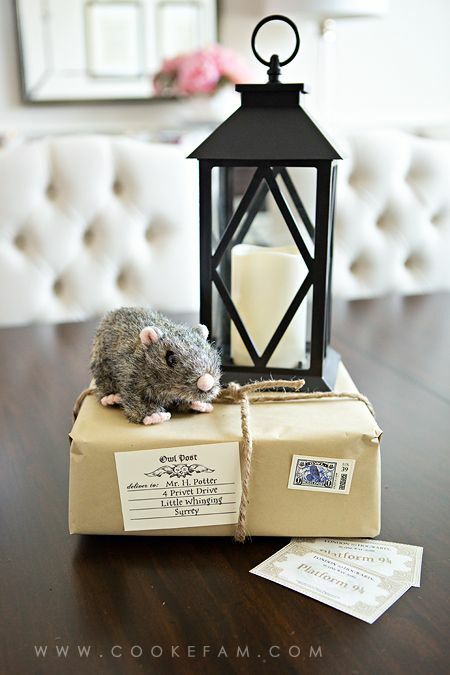 On the entry table, we had another Scabbers - he gets around - another package, and a lantern. 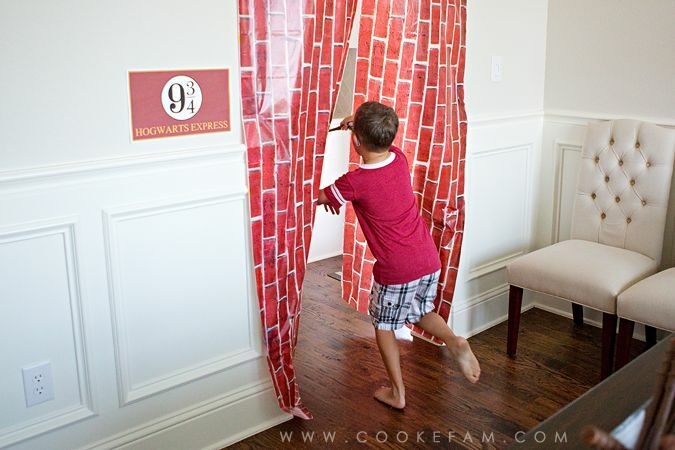 And a couple of tickets on the Hogwarts Express, because in this same room, was Platform 9 3/4. 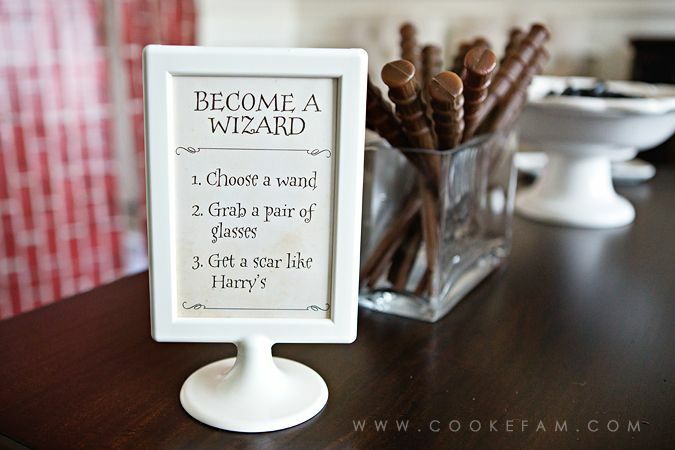 When the kids walked in, they could choose a wand and some glasses. I also had a couple of black eye liner pencils with which to draw scars on foreheads for the kids that wanted them (which was all but one). 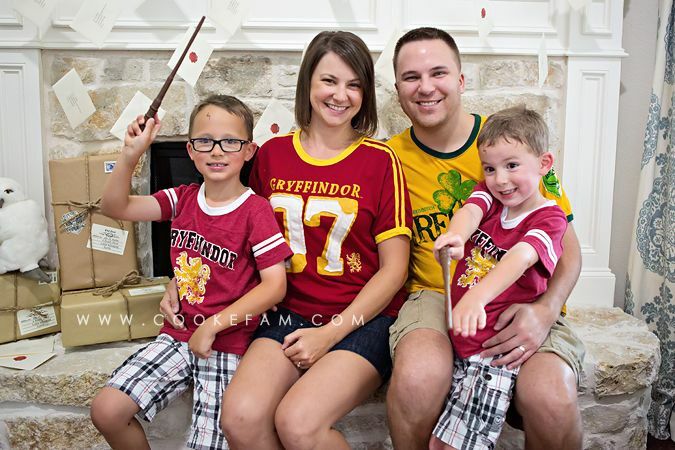 After they became a wizard, they could pass through our brick wall between platforms 9 and 10. Honestly, this was such an easy element, and I didn't expect just how entertaining it would be for all the kids. They really loved it! 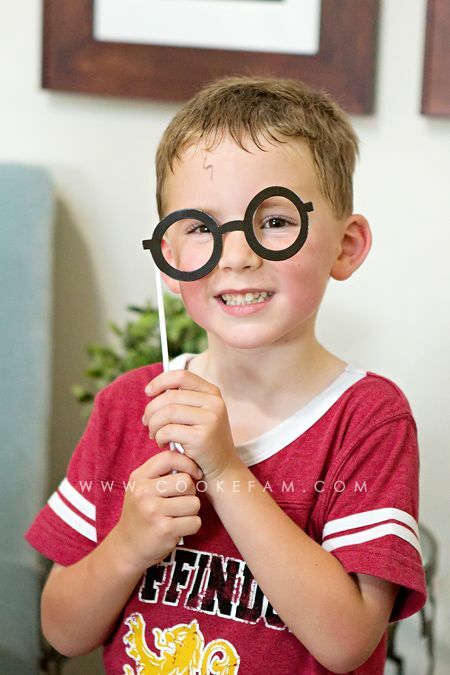 Once our friends started showing up, Ethan walked them through the process of selecting their wands and acquiring their glasses and scars. Then everyone ran through the wall and into the party. 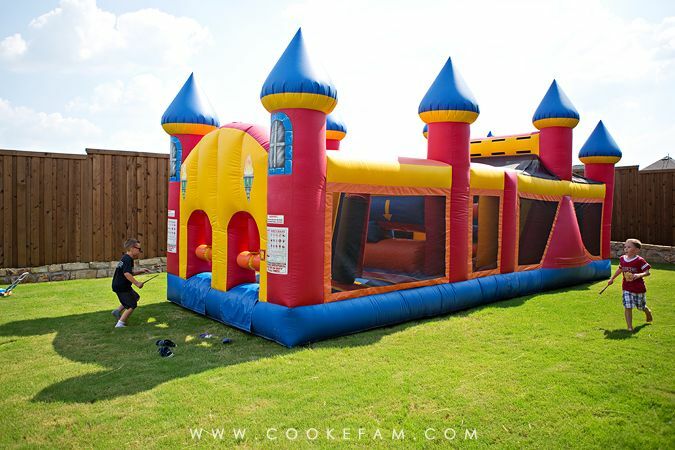 As fun as the inside of the house was, there were bounce houses outside. 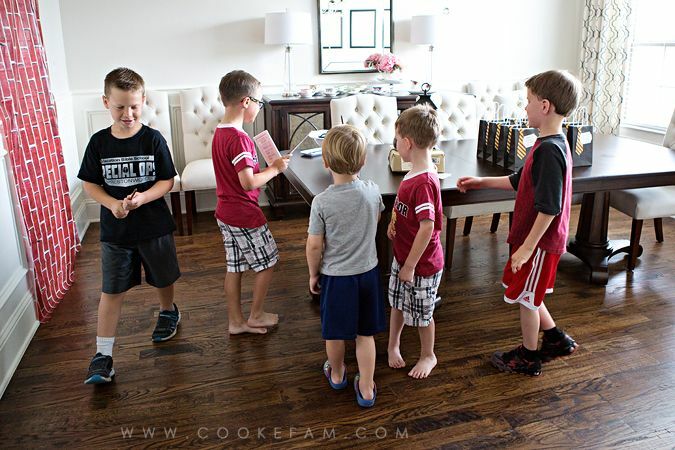 This is one of the reasons the boys want a party at home. 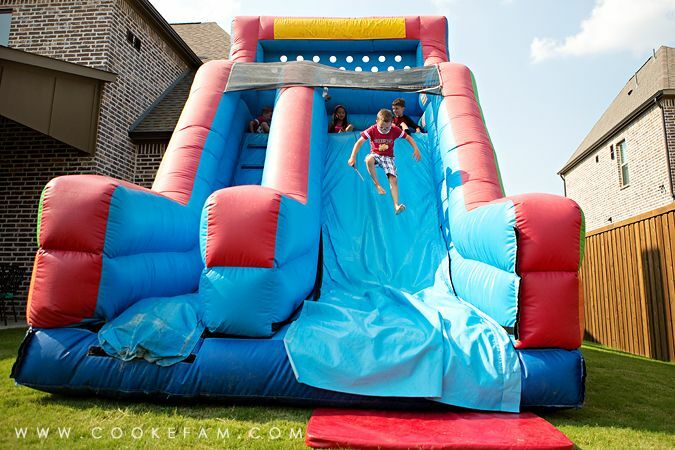 It is so fun for them to have these in our own back yard. For them, there's something different about it than the bounce places (which they also love). 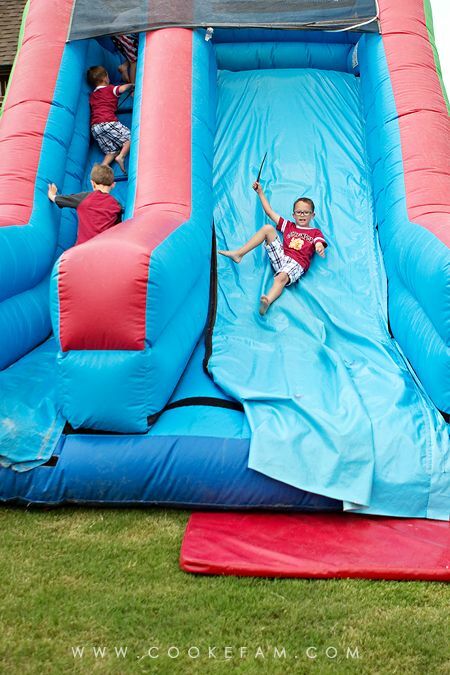 This huge one is an obstacle course. 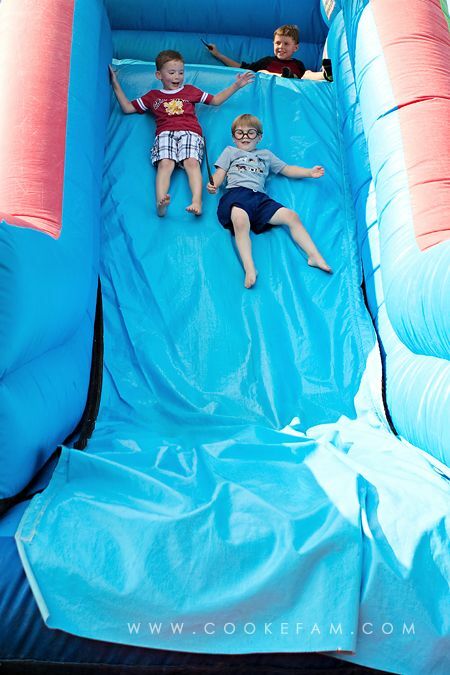 We also had a 16' dry slide. 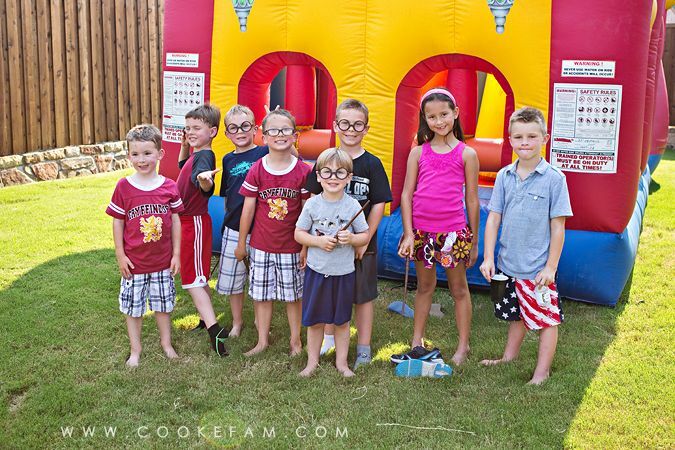 They all had tons of fun with both bounce houses. I got more photos of them on the slide because it was open and the obstacle course didn't allow me to really see the kids very well when they were inside. After wearing themselves out playing, it was time for cupcakes and pizza. 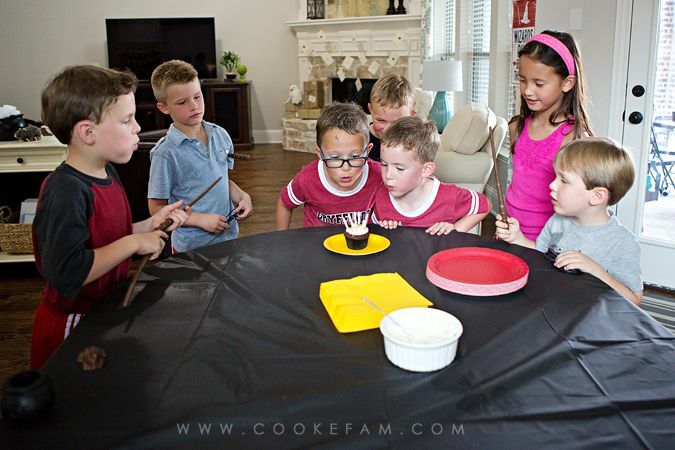 I love that Logan helped Ethan blow out his candles. That was very spontaneous, I think. 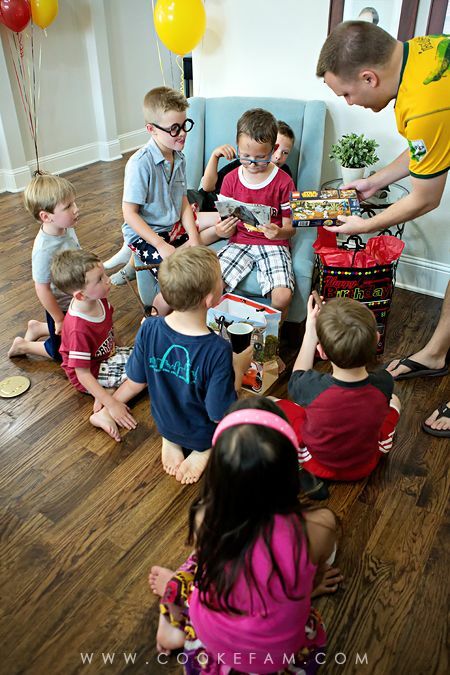 After everyone was filled up with food and treats, Ethan opened his gifts. 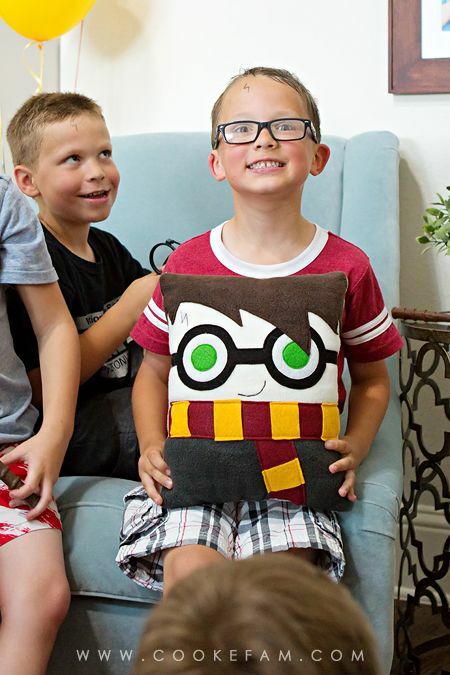 One of his favorites was this Harry Potter pillow from Mimi and Pop. Isn't it adorable? 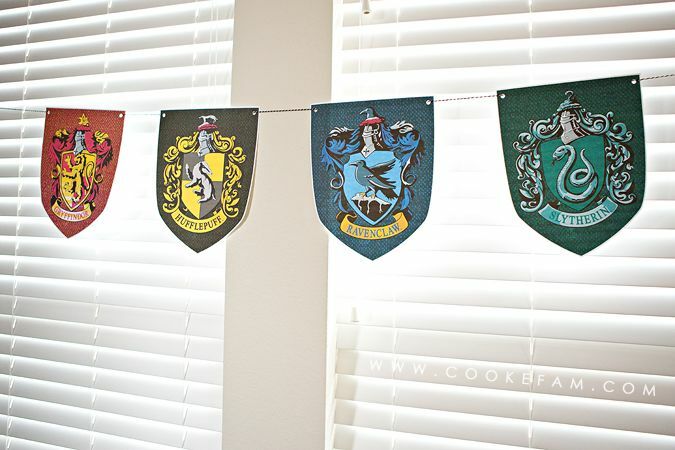 Its from an Etsy shop and it's really well-made. (Logan got a Ron one later). 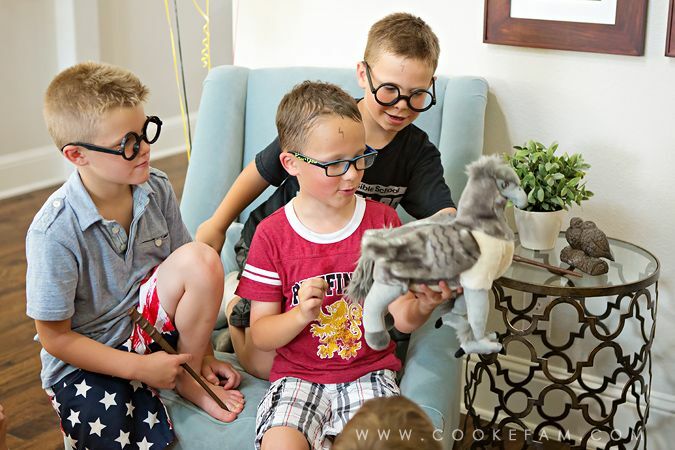 He was also impressed with the Buckbeak the Hippogriff plush. The last present he opened was a winner too, for sure. 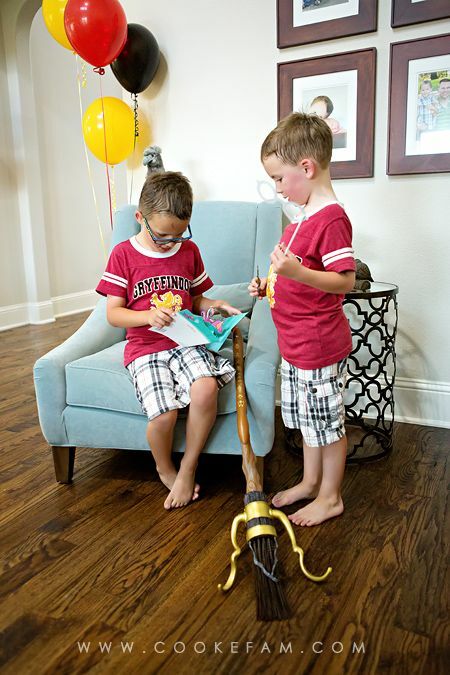 A broomstick from Nonnie and Papaw! This party was, and probably will be, one of my most favorite ones we've ever had. 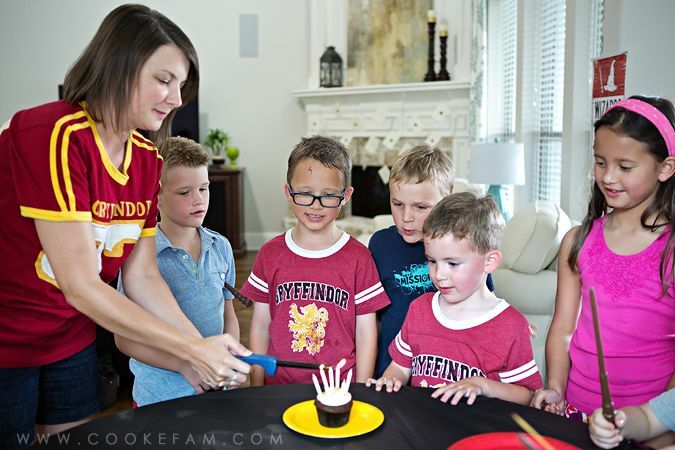 All of us had fun with it and the boys plan on playing with some of the decorations when they play Harry Potter with their robes they got last Christmas. 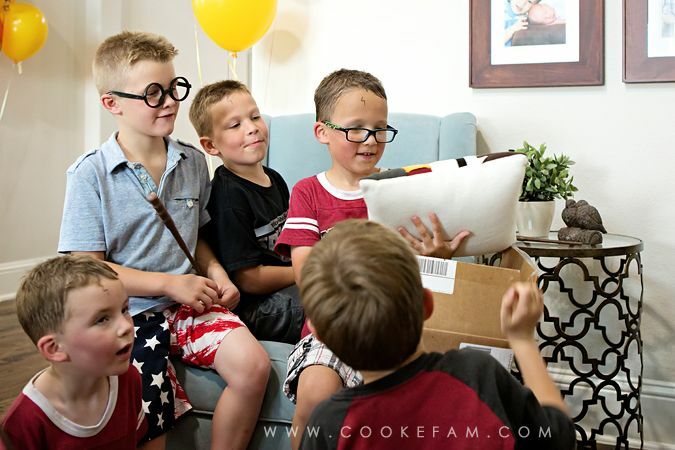 What a happy birthday party for our big 7 year old! Would it be possible to rmail me the Gillywater Label? Hi! Would it be possible to get a copy of the gillywater labels? I've been looking for something simple just like yours! I'd appreciate it!